If there's any one component that's more likely to go out of adjustment on your scooter (especially perhaps your Chinese scooter! ), it's the carburetor. If it does go out of adjustment lots of things can happen. It can make the scooter hard to start, it can make the scooter slow to accelerate, it can cause the scooter to idle badly and stall or it can make the scooter idle fast so that it's trying to go all the time and needs the brake to hold it stationary. None of these things are good. What the carburetor does is regulate the amount of fuel and air which are supplied to the engine. To go faster you need more fuel and more air and they must be in the right proportion. The fuel also has to be atomized as much as possible (i.e. be supplied in tiny droplets). The carburetor controls all these functions and generally does it quite well. The type of carburetor used on most 150cc GY6 type engines is a Keihin style CV carburetor with a 24mm throat. Keihin design carburetors are a well tried and tested design developed in Japan (Keihin is a region near Tokyo). Without removing and disassembling the carburetor, there are only two adjustments you can make, but these should take care of most minor problems. The first is the adjustment of the idle speed. 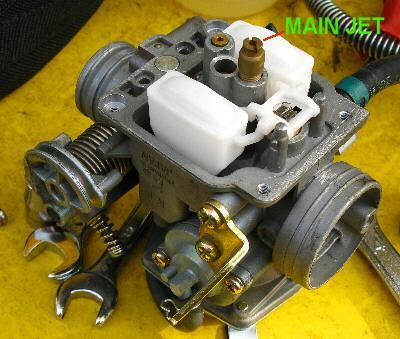 Above is a picture of a typical GY6 engine carburetor and the view is that from the right side of most engine configurations on 150cc Chinese scooters. There's a small spring loaded screw which adjusts the idle speed. It's right next to the throttle control which is connected to the twist grip on the right handlebar. On most 150cc scooters, idle speed should be around 1500rpm when the engine is fully warmed up. Don't make adjustments when the engine is cold. Take a 5 or 10 minute ride first. When the engine is cold the automatic choke is in operation and that can change the idle speed. If you have a tachometer, setting the speed is easy. If you don't, you want to set the speed to a low idle. Fast enough so that the engine doesn't stumble or stall, but slow enough that the clutch doesn't engage and try to move the scooter forward. On most scooters from 50cc to 250cc, this will be somewhere in the 1500-2000rpm region. 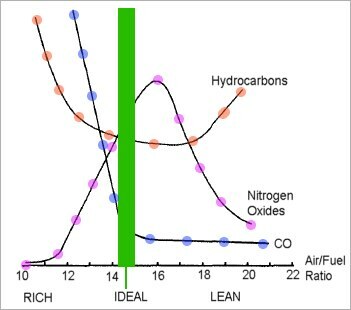 The other adjustment you can make is to the low speed fuel/air ("mixture") ratio. 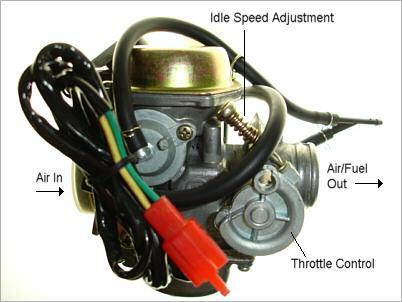 This is done on most scooters using a screw adjustment on the other side of the carburetor as shown below. This screw changes the air to fuel ratio at low speeds. It shouldn't need much adjustment, but the way to do it is to turn the screw very slightly (1/8th turn) and see if the idle speed goes up or down. If it goes down, turn the screw back 1/8th turn to where it started, then 1/8 turn in the other direction and see if the idle speed goes up or down. If it goes down, turn it back to where you started since you didn't need any adjustment! If the idle speed goes up, continue turning the screw in 1/8th turn steps until the idle speed is at a maximum. If it starts to go down, turn it back to get the maximum idle speed. You may need to go back to the idle speed screw to lower the idle speed if it's now too fast. So the basic procedure is to set the fuel/air mixture to give you the fastest idle, then use the idle speed adjustment to set the speed to the lowest rpm that gives you smooth running. 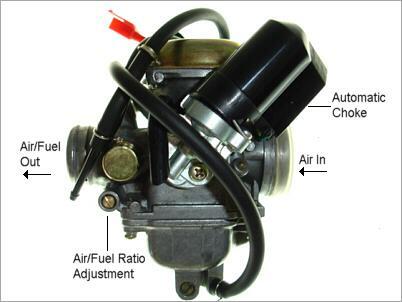 If the scooter idles well and runs fine at low speed, but has problems at high speed, the problem may lie inside the carburetor with the main jet. The fuel/air ratio at higher speeds is set by the jets inside the carburetor and to get at them the carburetor has be be removed and disassembled. This can be a tricky job as the parts are small and delicate. The good news is that these carburetors are quite cheap. You can get a new one for $50-$60, so if you can't make your scooter run smoothly and you don't like the idea of taking the carburetor apart, you can always replace it! To obtain maximum performance of your scooter, the carburetor must supply the correct fuel/air mixture all the way though the full range of throttle openings. The carburetor determines the fuel/air ratio, though the air filter and exhaust have some effect too. If the air filter is restrictive for example, it can lower the amount of air being supplied when the throttle is wide open and so make the mixture leaner than it should be. What controls how well the scooter runs when the throttle is most of the way open is the carburetor main jet. This is basically a hole, and the bigger the hole, the more fuel can flow. How big the main jet need to be depends on the size of the carburetor and how much air is flowing. Since the air is less dense at high elevations and at high temperatures, you may need a smaller hole (less fuel) at 95 degrees in the high dessert than you do at sea level and freezing temperatures. Manufacturers tend to use the smallest possible main jet for two reasons. First, you get slighly better mileage. Second, exhaust emissions (CO and HC[hydrocarbons]) are lower if the engine runs slightly lean (less fuel in the fuel/air mixture) than slightly rich (more fuel in the fuel/air mixture). Nitrogen Oxide (NOX) exhaust emissions are higher if the mixture is lean though, so it's a tricky balance. Since scooters don't usually have catalytic converters like cars do, running the engine lean is one way to keep CO and HC exhuast emissions under control. However if you go too lean, the engine may overheat, power will drop and emissions will go up. If you go too rich the scooter will splutter and performance will drop and emissions will increase. Manufacturers don't know what temperature you'll be riding in or what elevation you'll be riding at and so to stay on the lean side, they often use a jet smaller than the optimimum size for performance, just to make sure that wherever you are, the engine will be running on the lean side at full throttle rather than the rich side. The ideal condition is to have the correct air/fuel ratio at low speeds, not to run lean or rich, and under that condition emissions will still be well controlled and the engine will give good performance. However at high speeds and under hard acceleration it's best to run a slightly richer mixture in order to keep temperatures down and prevent pre-detonation ("knocking" or "pinging"). Maximum power is usually developed when the mixture is slightly rich. On most carburetors, the main jet is the one which sticks out as shown above. The jet itself is actually just the top part of the brass tube which sticks up out of the aluminum carburetor body (see the picture of the main jet over on the left). The lower part is the atomizer and it can stay in the carburetor body. Only the main jet need to be changed. Be sure to use the right sized screwdriver to remove it. Brass is quite soft and you don't want to damage the screw slot. So unscrew the main jet (you might need a wrench on the atomizer tube) and replace it with the new one. Screw it in tight, but you don't need to use a lot of force. Just make sure it's not loose. That's it. You've now replaced the main jet in your carburetor! Now put it all back together! Mount the carburetor back in the scooter. Make sure the hoses are secure on the air inlet in intake manifold sides of the carburetor. You don't want any air leaks. Then reconnect the throttle cable, fuel line and vacuum hoses. Finally plug the auto enricher back in. At this point you should be done, but check around to make sure you really have reconnected all the vacuum hoses properly of the scooter won't run well. You may have to crank the scooter over a few times since the carburetor has to fill with gas before it will start. If all is well, it will start up and idle well. Changing the main jet should have absolutely no effect on the idle, so if the engine stalls or won't start, it's not the main jet that's the problem. You've probably forgotten to connect something up, or you've connected the wrong hose to the wrong place or you've accidentally disturbed the idle speed adjustment screw. Assuming the scooter starts, take it for a spin. If the scooter runs better, you made a good choice for the new main jet. If it doesn't, then you picked the wrong size and you may need to try again. Most carbs on 150cc scooters have main jets from the factory of about 1.07 or 1.08mm (#107 or #108). If you fit a high flow air filer and performance exhaust you may need to go up as high as 1.3mm (#130). If you stick with the standard air filter and exhaust (like I did), maybe a #115 will give you better running, but #120 or #130 main jets would be likely to deliver a mixture that was too rich. I'm just about at sea level and winter is coming, so the air is cold (and denser). For me going from #107 to #115 made a significant difference, but for you it may not. However for around $6 and less than an hour's work, it's worth a try. I bought my new main jet from eBay - see . Most of the carburetors used on chinese scooters use the same sized main jet body (i.e. the threads on the jet are the same. Smaller engine sizes use smaller holes in the jet of course). If you've found this article useful, please bookmark it via one of the services listed below it or link to it so that others can find it.